Thousands of devotees received blessings and teachings from His Eminence the 7th Tenzin Lungtok Rinpoche, in Tawang, Arunachal Pradesh. Thousands of devotees received blessings and teachings from His Eminence the 7th Yongzin Ling Trul Dorjee Chhang Tenzin Lungtok Rinpoche for last three days starting from 1st of Nov to 3rd nov 2018. 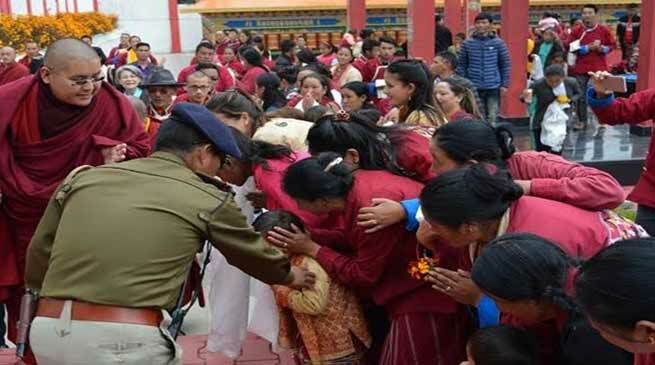 The Rinpoche on 4th of November visited Dorjee Khandu Memorial museum and Jangchub Choiten stupa at Phamla village Tawang, MLA Tawang Tsering Tashi alongwith hundreds of villagers from Gyangkhar, Khartoot, Bomba, Bumteng and nearby areas received the Rinpoche here. After seeing the museum HE Ling Rinpoche went to the video recording and comments room of the museum and recorded his video stating that,” late Dorjee khandu has given great service for the people, I am very happy to see the people being benefitted out of his deed and vision, My prayers and good wishes are always there with you all”. His eminence Ling Rinpoche on 5th of November will pay a visit to Bramdungchung nunnery and in the afternoon will give a talk on “peace of mind, Love and kindness” to the officers, Students and Govt, Employees at Zomkhang hall.